Our newly redesigned, huge lobby, with new party room to the right. 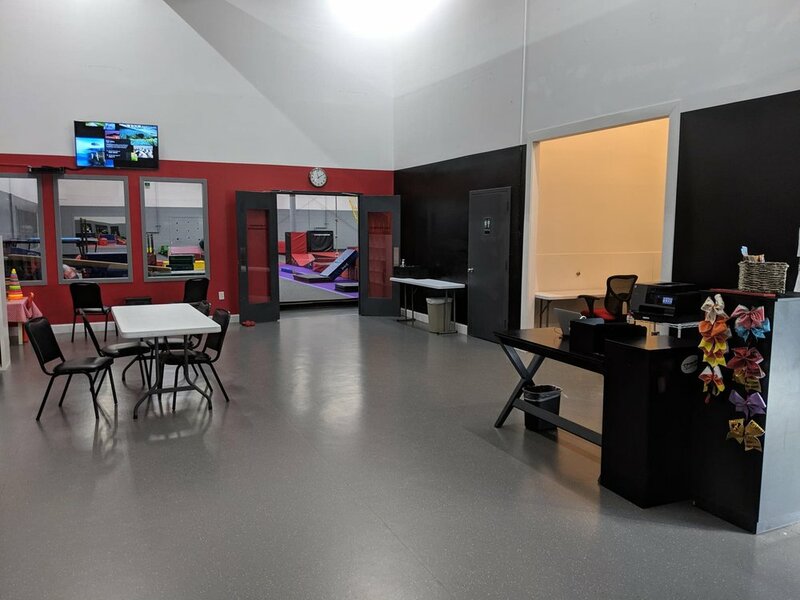 This is the perfect gym for extra-large birthday parties because we can sit 40 guests at long tables placed end-to-end! One of our viewing areas in the lobby. On the left, part of our toddler play area and library is shown. Our new preschool zone is roomy enough for 5 different circuits with balance beams, climbing ropes, a cargo net, trampoline, uneven parallel bars, blocks, tunnels, paralettes, and much more! 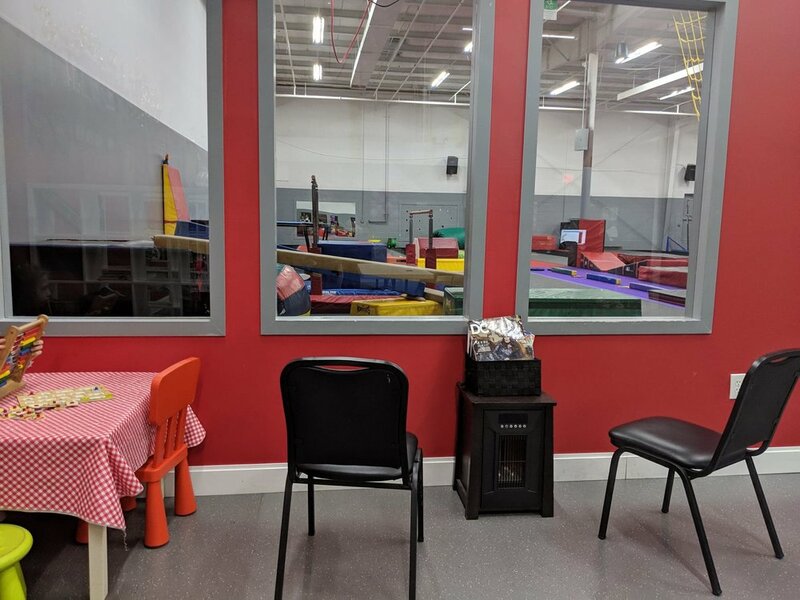 A view of the expanded spring floor (middle-top right) and preschool section (top left), perfect for tumbling and cheer team training, from the artistic gymnastics zone. Top-of-the-line balance beams and bars are a new feature of this gym. On the far left is the black resi-pit that marks the end of our 50-foot tumble track, behind which is a 50-foot rod floor and a 30-foot vault run. This parent-participation class, Sparklers, is a unique bonding experience for adults and their youngest children! Our budding athletes build strength along with gross and fine motor skills, develop muscular coordination, learn playground, basic gymnastics, and social skills, and expend their energy as they play. Our coaches understand that learning tumbling means, building flexibility, strength, and balance, as well as the fundamental shapes and techniques necessary to perform safely and successfully. Starting at age 3, preschoolers can start learning gymnastics, tumbling, and cheer foundations! We combine teaching skills with lots of fun so that kids are excited every week to come to class and learn more. We offer world-class, advanced training in our Rockets, Tumbling, and Cheer classes, in addition to our Team Track coaching sessions and private instruction classes. Dynamite2 features a large preschool area with specially-designed bars and beams, plenty of fun mats and blocks, a rope and cargo net, and a trampoline—which changes every few weeks for a new challenge! For our older kids, we have Olympic-level bars and beams, a 60-foot tumble track, a 72-foot rod floor, a competition-sized cheer floor, and plenty of mats, blocks and other equipment to progress safely.